The Bosch 1-1/4 in. SDS-Plus Rotary Hammer features an unmatched power-to-weight ratio with 8.5 amps, 3.7 ft. lbs. of impact energy and weighing in at just 10.3 lbs. for superior performance. Designed to control vibration, it features vibration reduction in the hammer mechanism while the grip area provides maximum user comfort for extended periods of work. With a multi-function selector, you can choose between three operational modes�rotary hammer, hammer only and rotation only�to conveniently fit each unique task. Tbook.com crawls the web to find the best prices and availability on Hammer Drills and related Tools and Hardware products like Bosch 8.5 Amp Corded 1-1/4 inch SDS-plus Variable Speed Rotary Hammer Drill with Auxiliary Handle and Carrying.... For this page, related items include products we find that match the following keywords: "Hammer Drill" at our vendor partner Home Depot. 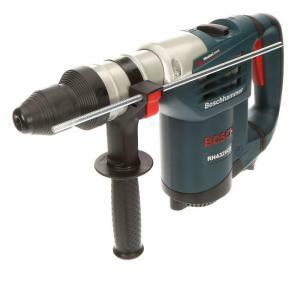 Bosch 8.5 Amp Corded 1-1/4 inch SDS-plus Variable Speed Rotary Hammer Drill with Auxiliary Handle and Carrying... is one of 148 Hammer Drills and related products listed in the Tools and Hardware section of Tbook.com If you have any questions on this product, please give us a call at 734-971-1210 during the hours of 9am - 5pm EST for assistance. Thank you for shopping at Tbook.com, the Internet Department Store!